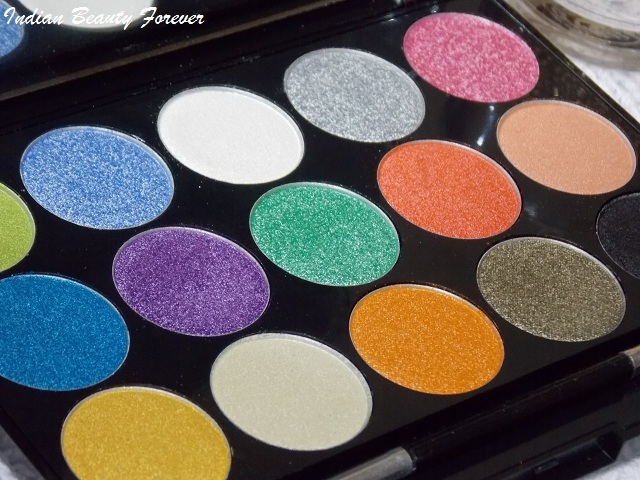 I am going to review an eyeshadow palette that I received from bornprettystore.com If you aren't aware about the store, then let me tell you, Bornprettystore is a great place to shop for all the nail art related products right from stickers to acrylic nails to some advanced nail art tools. Apart from that, they also have makeup related products along with some other stuff. I chose this eye shadow palette from their store. 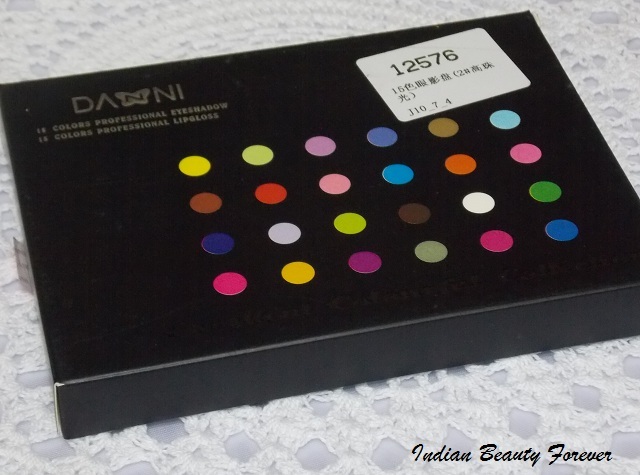 The palette consists of 15 shimmery eye shadows and it costs around $14, approximately 840 Rupees. The eye shadow palette comes enclosed in a carton and bears this full sized mirror which is really big to use this while you do your makeup. I have already used this mirror to do may eye makeup. It also has a dual sided applicator, which is well finished with very soft sponged tip which help apply the product well. But that's a different thing that I hardly use these applicators to apply eye shadows, I would rather use eye makeup brushes. I find these applicators to make the shadows patchy! Its sleek and compact design makes it easy to carry and travel with. Till now, it was an okay or decent palette but when I swatched it, I was literally in awe of it. the shades are so very pigmented. Their pearly shimmery texture makes them soft to touch and blend. Some of the shades are a tad powdery and some are very satiny that will blend effortlessly. The first row has a yellow lime green color, frosted light blue, pearly white, frosted grey and a frosty pink. The second row contains a beautiful blue, frosted purple, frosted green, peachy orange and a light peach while the third row has some very beautiful and bright colors like a yellow, champagne color, dark turmeric yellow, an olive color and a stunning black with fine shimmers. It's absolutely a gorgeous color to create a smokey eyelooks. Pearly white and the champagne color can be used for highlighting browbone and the inner corner or just on the entire lid for some light reflection. I have tried a couple of them and staying power is quite good for most of the shades. Since they are shimmery, you are bound to face fall outs, so better be careful while using these shadows else the under eye area can look messy. It's because shimmery colors are more difficult to get rid of. Try using a tissue or apply some loose powder underneath the eyes before going for eye makeup. I have not used all of them on my eyes but by their texture and overall feel, I think the ones that are more powder and frosted will crease while the satin finished ones will not crease as much. 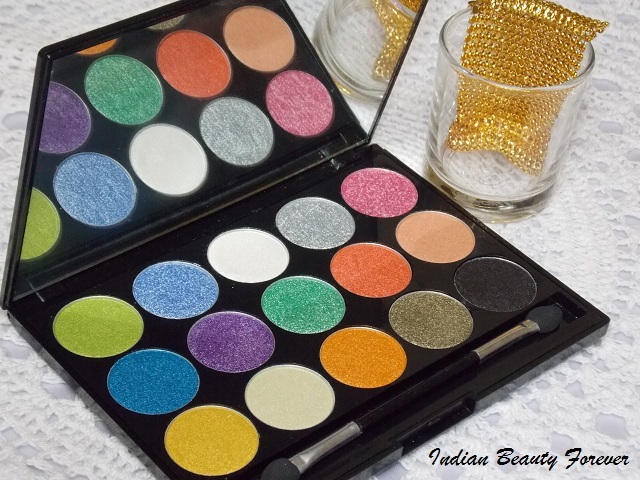 As The palette has shimmery glittery colors, that you can use for your evening makeup for a party, weddings, ceremonies etc. 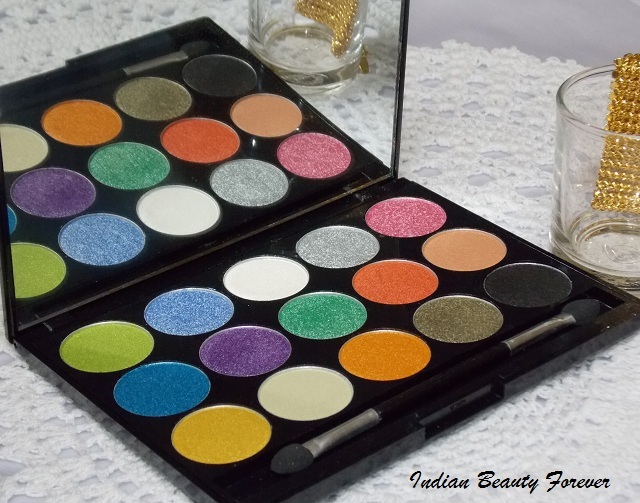 Take: This 15 color eye shadow palette from bornprettystore has pigmented colors with satiny soft texture that blend effortlessly, fall outs would be there that can be taken care of. 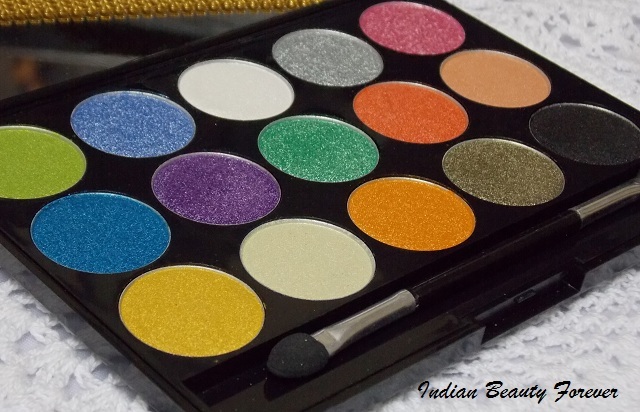 The palette has mostly bright colors and less neutrals so, if you are looking for a good pigmented and shimmery bright eye shadows then this can be definitely tried. It is a treat at the price. considering the fact that singles can be quite expensive. 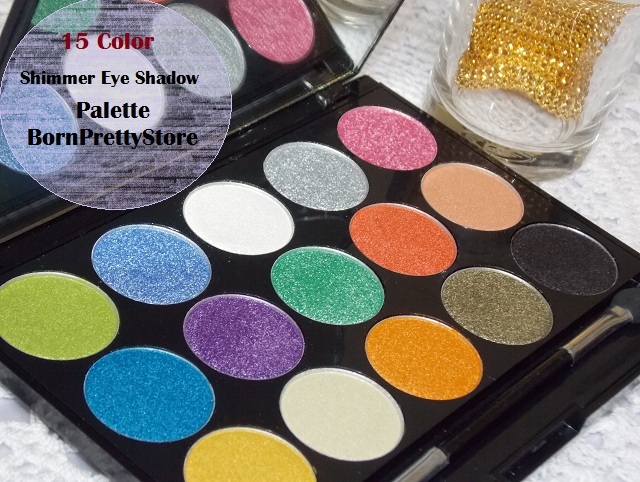 Bornprettystore has a worldwide free shipping so, you needn't to pay extra for this palette except for the price. If you shop from there, you can use this coupon code NJH10 to get extra 10 % discount.